Driven from their homes by a brutal military crackdown, Rohingya refugee children use art to share their stories and dreams for the future. One year ago, hundreds of thousands of desperate and terrorized Rohingya fled a military crackdown in Myanmar. UNICEF donations are providing health care, education and access to safe water and sanitation for children and families in the sprawling refugee camps in Bangladesh. There's a huge commotion going on in a small corner of the Balukhali camp for Rohingya refugees in southeastern Bangladesh. A group of excited children have gathered around UNICEF USA staff and two Americans who have come to the camp to teach them how to paint. The children and their families were forced to flee Myanmar when the army launched a crackdown against Rohingya Muslims, triggering one of the fastest growing humanitarian crises in the world. It is estimated that more than 800,000 refugees have left Myanmar since August 2017, settling in camps in Bangladesh. The pair at the center of the commotion are American artists Joel Bergner, 39, and Max Frieder, 28, co-founders of Artolution, an international community-based public arts organization. 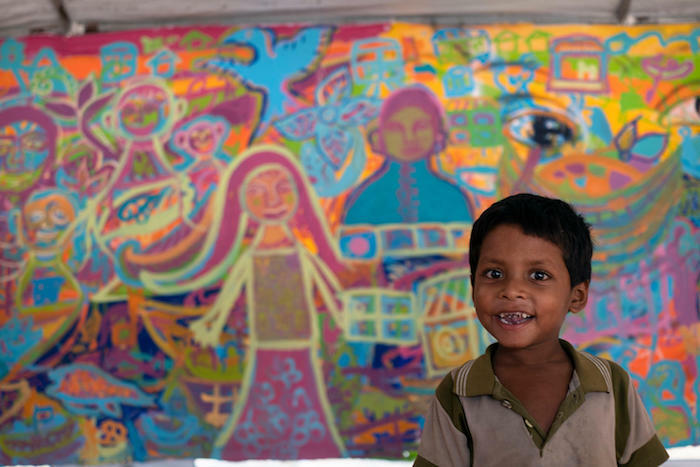 The two have teamed up with UNICEF USA to create a mural in the Balukhali Child-Friendly Space. "Our main objective is to address critical issues related to armed conflict, trauma and social marginalization by developing artwork that promotes reconciliation, healing and community empowerment," says Bergner. With this in mind, UNICEF USA and Artolution have brought a huge oil canvas (measuring 21 feet by 10 feet) that was painted by over 200 families at the Westfield World Trade Center in New York in March as a gift to the children of the refugee camp. 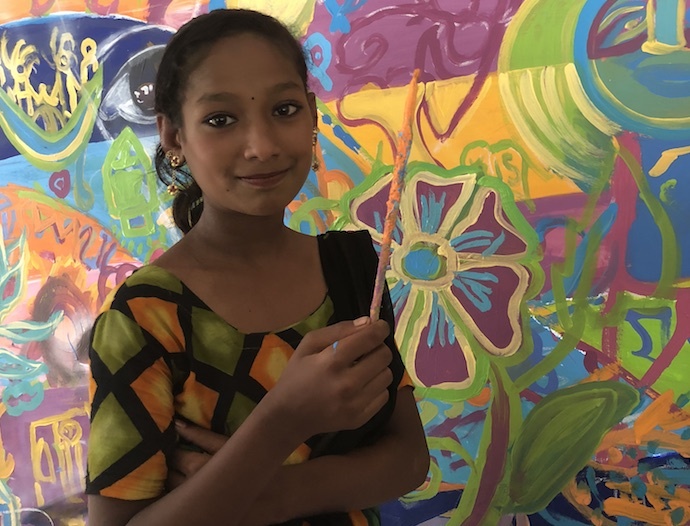 The mural, with its theme of peace, strength and unity, has now found a permanent home in this Child-Friendly Space, an area reserved exclusively for children under 14 and their teachers, which is run by UNICEF and its local partners in Balukhali refugee camp. The aim of the Child-Friendly Space is to provide children with a safe place where they can play, sing, dance, learn, draw and just do what they do best: be kids. 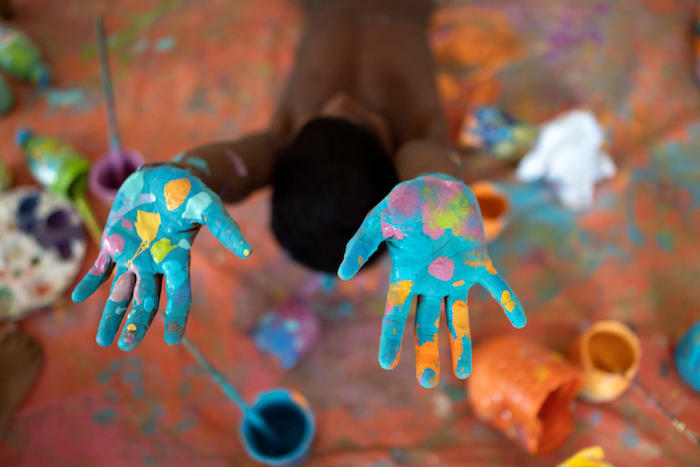 Simple activities like painting help children overcome trauma and find peace and healing. 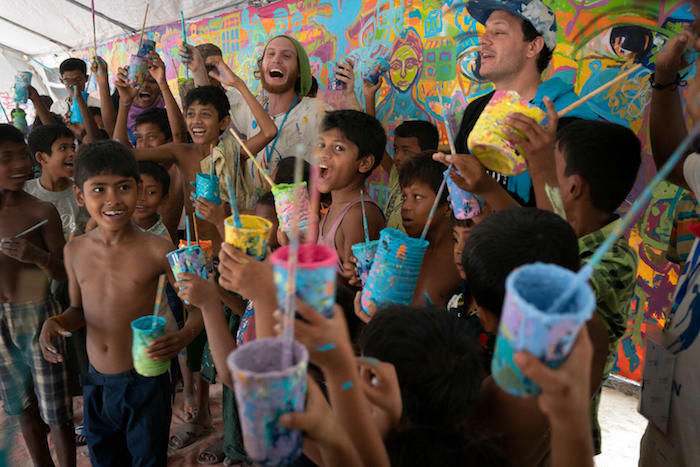 UNICEF USA, Artolution and eight supporting Rohingya artists spent two days working on an exchange mural painted by children in the camps which they have taken back to New York, where it will be permanently installed for visitors to see in the Oculus at the Westfield World Trade Center (in the very spot where American families created the mural that was sent to Bangladesh). The children wanted to tell their stories: watching their homes in Myanmar burn to the ground as military helicopters hovered in the sky, seeing parents and loved ones shot and killed by the army, crowding onto boats for the journey to Bangladesh, building new homes in the refugee camps. Lastly, they drew pictures of themselves and their hopes for the future, depicting their dreams of going to school and rebuilding their new lives. The paint-splattered group had a tough task to complete the mural in time. Many of the children are still processing their traumatic escape from Myanmar. For many of the Rohingya children, today was their first experience making art. UNICEF USA and Artolution start with a series of ice-breaking exercises with the children to establish a rapport before the artwork begins. The children are boisterously encouraged to be kushi (Bengali for happy) before they begin to paint. Eight Rohingya artists, four men and four women, have been trained to help facilitate the mural painting. One teacher, Mohammed, came to Bangladesh in October 2018 along with thousands of other refugees after an 11-day trek on foot. "I enjoy my job," he says. "It makes me happy and helps me to forget about what happened in Myanmar. "The benefits are twofold. The kids like drawing and painting, which at the same time helps them and us forget about the suffering we have experienced in the past. I hope that the people of New York will enjoy the mural these Rohingya children have painted for them as a gift from the refugee camps of Bangladesh. It is our way of saying thank-you to them for supporting us during our suffering." The monsoon season poses new dangers — flooding, landslides, disease outbreaks — to the 703,000 vulnerable Rohingya children who require lifesaving assistance. Please donate now to help Rohingya refugees. Sofia Van Raan is a marketing and communications manager at UNICEF USA. Alastair Lawson Tancred is a communications officer for UNICEF Bangladesh.